• Year 2000 M&R Printing Equipment Inc., Model Precision Processor 5 Station Screen Printer, 65” x 80” Capacity, with Qty 5 U.V. Cure Reactors, Dual Lamp Units, $1mm Original Cost. 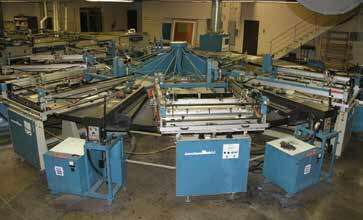 • Harris Seybold – Saber IV, Mechanical Paper Cutter, 65” Capacity. Tools, Off ice Equipment, Large Quantity of Paper Stock in Sheets and Rolls, and Much Much More. • Registration: To Register For The Sale Visit The Western Graphics Auction Page At www.newmillcapital.com And Click The Online Bidding Tab. • Buyers Premium: A 15% Buyer’s Premium will Apply to All Sales in Addition to Applicable Local and State Sales Tax.